Discovering Toyama and parts of Japan has always been a dream for me. Although I have not been able to fulfill this dream fully so far, I still try to make time to go on a bicycle ride whenever I can. Today, I wanted to share with you a bicycle journey taken by someone else in the Toyama area. It is not me but a person called Kelsey Lark who wrote an excellent article about her experiences and joys while riding a bicycle in the Toyama Prefecture. Following is the article she wrote. Please enjoy the writing. TOYAMA. — After living in Japan for seven years, I don’t often get excited about traveling to new places and doing new things here. I’ve been to so many summer festivals that they’ve all kind of blurred together, and if I have to wear the obnoxiously painful geta sandals one more time, I might scream. However, during a recent cycling-themed trip to Toyama Prefecture, I fell back in love with Japan and its rich history and culture. It rekindled the old flame with locations that were distinct and interesting, food that was incredibly fresh and flavorful — the trip was like a breath of fresh air.Toyama is an incredible getaway destination that has just added cycling (both short and long-distance) to its many attractions. As an avid cyclist myself, I can’t wait to visit again soon to fall in love all over again. To get there, I took the Shinkansen from Tokyo Station to Shin-Takaoka Station, which took just under three hours and cost ¥13,060 for an unreserved seat. Depending on where you’d like to go, you can also arrive via Toyama Station, which is a little closer to Tokyo. After arriving at Shin-Takaoka Station and getting briefed on Toyama’s newly completed cycling course, I met up with my tour guide for the three-day adventure. We promptly headed out for our first destination — the ancient village of Gokayama. The first thing I noticed in Gokayama were the gassho-zukuri, which are traditional Japanese houses with steep thatched roofs. I was amazed to learn that these roofs cost around 20 million yen (around $180,000) to replace, and they need to do so every 15 to 20 years. We got to see inside one of these gassho-zukuri houses called Yusuke. On the first floor, we sat around the traditional Japanese fireplace while the owner poured us tea and told us about the house and town. He shared with us the story of how Gokayama became so prosperous hundreds of years ago by harvesting the straw needed to make these gassho-zukuri roofs, and then he guided us to the second floor where we could see the roof from the inside. They also had an exhibit showing the straw harvesting process, the owner’s photographs of his beloved village in every season, and how Gokayama became a World Heritage Site. After our history lesson at Yusuke, we were a little famished, so next, we walked 100 meters to the nearby Matsuya Restaurant. When we sat down to eat, they made a point to mention that all their ingredients are locally sourced. At first, I was quite impressed, but this became a common theme at every restaurant and hotel we ate at during the trip. It’s no wonder the food in Toyama is so fresh. Being right next to Toyama Bay and the Japanese Alps, you have access to some of the freshest fish and vegetables possible. The next day I met a couple of local cycling guides, Naoko and Take, who would show us around Toyama using the newly completed cycling roads. There are three major routes: Toyama Bay Cycling Route (88 km), Toyama Countryside Cycling Route (71 km) and the express Toyama Bay and Countryside Cycling Route (18 km). Each route is painted with blue navigator lines at regular intervals, so it’s super easy to follow even if you don’t speak Japanese and/or are not an experienced cyclist. Plus, there are loads of bicycle stations and bike-friendly cafes along the different routes. This Toyama Bay and Toyama Countryside Cycling Route Map have all the information you need. With our guides, we made plenty of stops to learn about Toyama’s culture and history, taste some local sweets, and even went to see a live crab auction. Naoko led the way and took us to see some beautiful sights. Even though it was raining, we got to see Toyama’s beautiful and diverse geography, especially while cycling along the gorgeous Toyama Bay. In October 2014, Toyama Bay became a member of the Most Beautiful Bays in the World Club, which includes famous bays such as San Francisco Bay, Ha Long Bay, and the Bay of Mont Saint Michel. While I’m all about cycling, Toyama is great for many different sports. They have events year-round, with the most popular ones including a cycling event, marathon, and triathlon. It’s no wonder Toyama attracts all kinds of activities — its varied topography is great for a variety of training, both on hills and flat courses. Another great aspect of Toyama is the beautiful view you can enjoy outdoors, whether it involves sports or not. 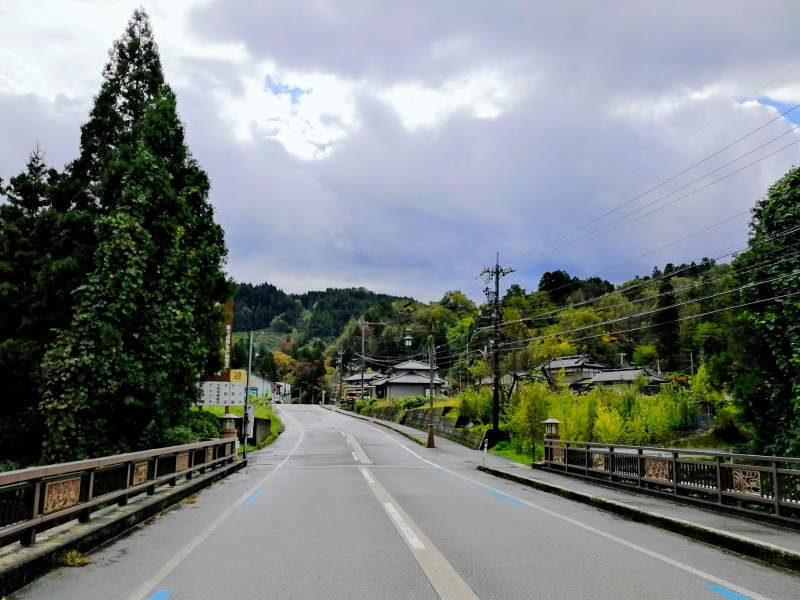 Our cycling tour took us through the countryside plains of Kamiichi to the beachside paths of Him, but you can enjoy these sights just as much on a car ride or local train. You’ll never get bored of the views in Toyama, there’s just so many! We encountered some rain during our stay in Toyama, but that didn’t stop us from having fun; we just moved indoors to soak up our culture instead. On our last day, we visited the magnificent Toyama Glass Museum. From the outside, it looks cold and intimidating with sharp edges, but indoors it has a warm and inviting atmosphere with soft wood detailing. It was also incredibly distinctive in the fact that the building is essentially split into two halves — one half being the glass museum and the other half being a library. We were lucky to enjoy even more of Toyama’s culture on our last day during a visit to the rustic town Ecchu Yatsuo, located in the southern region of the prefecture. First, we got a history lesson at the town’s tourist center that features three of the huge dashi, or floats, that they parade around town during their yearly Owara Kaze-no-Bon festival. Afterward, our tour guide showed us around the charming town, which included some lovely cafes and a creative kimono upcycle shop. During my trip, I was able to enjoy experiences unique not only to Japan but also locally to Toyama. One of my favorites was making my own sake cup out of tin at a factory called Nousaku, where not only can you make your own tinware, but also get a tour of the factory and browse their expansive gift shop of tableware and home decor. While on the bike tour, I was also able to have a special spiritual experience while stopping at the Ooiwasan Nisseki Temple. A guide there first showed me the temple, which had been built around a Buddha statue carved into a gigantic boulder. She then took me to a tatami room next door where she showed me how to draw a picture of the Buddha statue and asked me to write down a wish. A few days after returning to Tokyo, I received a good luck charm in the mail from the temple to help my wish come true. Just before getting on the bullet train back to Tokyo, we made a quick stop at Onomatopoeia Rooftop Garden in Toyama Prefectural Museum, which features several Japanese onomatopoeiae along with corresponding statues for visual representation. They even had English translations, too! Kids would love this educational little park, but even as an adult I had fun and learned some Japanese. I fell in love with Toyama during my brief three-day stay in the captivating prefecture. There’s something for everybody, whether you’re looking for outdoor sports, history, and culture, or just to relax and enjoy excellent food. You can have a getaway in Toyama like nowhere else in Japan, so if you’re living in Japan or planning a visit here soon, I highly recommend you add Toyama to the top of your list of travel destinations. For more information about Toyama and to plan your next trip there, check out Toyama’s tourism site, available in both English and Japanese.